When I first clambered into a canoe, almost twenty years ago now, I never thought that it would be such a big part of who I have become. The year was 1992 and I was engaged to the love of my life. My fiancé, Bryan, took me on a romantic weekend getaway to Ontario’s Algonquin Provincial Park, a campground at Pog Lake on the Madawaska River. We had borrowed an old Coleman canoe made of fibreglass. It was a beast of a boat and surely weighed close to ninety pounds. We hoisted the canoe down the steep embankment on our site to the murky water of the Madawaska. This was to be my first day trip in a canoe. I remember putting on the musty old life jacket and awkwardly making my way into the canoe. I entered the stern overcome with fear. My knuckles were white as I clung desperately to the gunwales and half crawled, half walked to the bow. The boat was rocking with every movement and all I could think of was falling in and being devoured by a water snake. The day was uneventful and next thing I knew it was late afternoon and the sun was sinking into the horizon leaving the sky with soft warm hues of pink and orange. We paddled downstream and into a series of small lakes. That was where I saw my first moose quietly enjoying his dinner of lily pads just a few yards away from us. 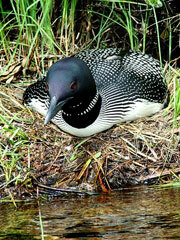 On the return trip we encountered a loon, an interesting bird that I had only seen in books. I was so close that I could have reached out and touched his feathers. I remember the day as if it were only yesterday even though it would be another ten years before I held a paddle. I was in love, not just with Bryan but with the wilderness and peacefulness of travel on the water. I returned from this excursion feeling unlike I had never felt before. It was a wonderful experience and now I was getting married. I was on top of the world. Time passed. The wedding was beautiful. My career was going well. Then, without warning, I lost my job because of a corporate buyout. Depression became my routine. My weight started spiralling out of control along with my self esteem. More time passed. I was now well over three hundred pounds. I felt empty and lost and didn’t know how to find myself. Getting out of bed in the morning became difficult and sleep eluded me at night. I was drowning in my own self-pity and self-loathing. Later the following year I started a business and it blossomed. My career was on the fast track again and I had the unconditional love of a wonderful man, yet I was still unhappy with myself. Something was missing. Would this self-torment ever end? Would I ever get myself together? It was a small and loving idea that jump started my recovery although at the time I didn’t see it as kind at all. One day my knight in his shining car came charging in from the bookstore with copies of every canoe and backpacking magazine he could find. He knew I loved the outdoors and he was also aware that I had been putting off any adventure because of what I thought people would think if they saw someone my size stuffed into a backpack or sitting in a canoe. He said that he wanted to start exploring the wilderness too and asked if I would go with him. I sobbed uncontrollably. I had secretly bought a backpacking magazine. I wanted to do this more than he could have imagined but the walk to the mailbox was more than I could handle. How was I ever going to walk from camp to camp with a backpack? How would I ever find gear to fit me? We talked and I leafed through the magazines and the more I read, the more I thought that maybe I could do this, but not canoeing. I was afraid that my weight would be too much for a canoe. I thought I might break the seat. Once Bryan refuted the issue, my concern turned to the boat being too weighed down at one end, so like a spoiled brat, I refused to discuss it further and we decided backpacking was best. I started to walk. Flat pavement at first, then day hikes that became more strenuous as time went on. I completed my first backcountry trip on the Bruce Peninsula at Georgian Bay. The pounds were being shed and my breathing had improved. We planned for several more trips that year and I was excited. I had gone from the assumption that people were thinking I had no business out there because of my size, to realizing that most people were extremely supportive. My self-esteem was on the rise and I finally started to feel good about my life, however, it was to be short lived. It was early June, four in the morning; I awoke from a restless sleep. There was fog in our backyard. That was strange, not foggy in the front yard. Suddenly I realized it was smoke. The house was on fire. Only a few moments to get to safety! Explosions! Sirens! Disbelief followed by tears. Everything gone, everyone safe, dreams shattered; homeless. Seven months of stress, unlike anything I had experienced before. Depression tried to take hold of my life again. But not this time, I vowed to get out there and explore; life is too short to waste and I was lucky to be alive. So there we were backpacking again, just the two of us. One trip in particular was extremely hot and I was certain that I would need a blood transfusion after the blackflies and mosquitoes were done with me. Screw that. We hiked out and found a campground, Pog Lake. The memory of my first paddle came flooding back to me. I was transported back to 1992 again. Then Bryan suggested that we hop on over to Canoe Lake and rent a canoe. I wanted to explore the famous Mowat Landing area that Tom Thomson frequented. There were no thoughts of being overweight or breaking the seat. It didn’t even enter my mind. All I could think of was recreating the special moments we had shared on our first trip together. We bought two over-priced ham and Swiss cheese sandwiches for a picnic lunch and set out on the lake to view the historical sites. Then we decided to head up Potters Creek. The creek is a winding one and very shallow in the summer which meant we had to wade through some parts and portage others. We paddled under the decaying timbers that had once supported a road almost 100 years before. 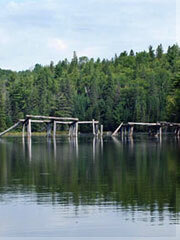 Skeletal remains of the bridge remained and it seemed eerie yet beautiful at the same time. Then we approached a beaver dam. What now? I’d never done a lift over before. Now it is a well known fact that I am not the most graceful person on the planet and mixing this with a canoe could have been a bad move. Because of my history as a klutz, I studied the dam carefully and called back to Bryan indicating I was going to step out onto the logs and then pull the canoe broadside so that he might disembark. He couldn’t hear me but I didn’t realize that. The water at his end was seven feet deep. I had one leg on the dam and the other in the bow of the canoe. He stepped out of the stern. The water was over his head. I landed at the muddy edge of the beaver dam and was soaked to the skin. The canoe was full of water. Our lunch and my camera were floating downstream. My hat was dripping and I was speechless, which for those who know me is a pretty major event in itself. We righted the canoe, gathered our belongings including the soggy sandwiches and headed back to the put-in at Canoe Lake. As we travelled across Canoe Lake I hit the edge of my prescription glasses with the grip of my paddle. The magnetic sunglasses popped off and sank to the bottom of the lake. I made Bryan go back hoping that I was wrong and my sunglasses would be floating on the surface. No such luck. More silence. I was never canoeing again! Then it happened. We were turning the canoe around in a grassy bay. The canoe was less than a foot from a nesting loon. It was an incredible sight. She looked at me and our mishaps were immediately forgotten. I was in love with paddling again. I have experienced dozens of trips since then. I’ve encountered the most beautiful sunrises and sunsets. I continue to find new adventures and meet kindred spirits. I’ve discovered things about myself that surprise me, like being stronger and less fearful that I ever thought possible. I can do anything I set my mind to no matter what the barriers. For example losing almost half my body weight or carrying a thirty-five pound backpack over a slippery portage. I’m having fun meandering down rivers, battling waves on windy lakes, playing in waterfalls, star gazing on rock outcrops and seeing the reflections of a billion stars on a calm lake. I teach my children about the wilderness and how important it is to protect our backcountry areas. I do this by taking them out there and nurturing a love for the wilds. Although it is technically spring, it still feels like winter in Ontario, but my thoughts are for the open water. Trips for this year are already planned, for my incredible longing to paddle has surfaced again. There is something mystical about travelling in the early morning with only the sounds of my breath, my paddle dipping in the water and the gentle wet ripples against the bow, occasionally punctuated by the call of a loon. I call this the paddle song; sweet music for a canoeist who feels at one with her surroundings and herself.